If you’re anything like us, researching and trying out some of the latest in drone tech is one of the best perks of the job. That said, there are some products we’ve encountered that stand out from the crowd. This list details only the products that we’ve found so valuable that they’ve become essential components in our operations. We hope you find them as useful as we have! This is, hands down, one of our most highly recommended devices for drone pilots. Look, drone batteries are expensive. If you’re like us, and have more than one drone in your lineup (let alone a fleet!) buying enough batteries for each drone can add up to thousands of dollars. Enter the Paxcess 100-Watt Portable Power Station. This unit is versatile, convenient, and with 150 Watt Hour capacity, it’ll give you the juice you need to charge most drone batteries 3x or more. With dual 110V AC outputs, DC 12V and USB ports, it can not only bolster your fly time, but can also power lights, recharge phones, laptops, and even run small appliances in an off-grid or power outage situation. And because this unit is small enough (only 3.3 lbs) to go almost anywhere, its uses are nearly limitless. There are definitely more expensive options on the market that’ll give you more charges (like the Goal Zero Yeti 1400), but we recommend smaller units because of their superior portability and flexibility. One of the most important pieces of equipment for any drone enthusiast is the SD card. Many of today’s most popular camera drones (including the Autel X-Star series, as well as the DJI Mavic, Phantom, and Spark) require the diminutive Micro SD card. Because these things are so small that they are easily lost or misplaced, keeping them organized is a must. Which is why we recommend this convenient little device from SDcardholder.com. This holder is small enough to fit in most any storage compartment (i.e. the narrow accessory pockets of most drone cases) so it can go with you on every job. And although it’s one of the most affordable options on the market, it is designed to hold up to 11 cards (including an SD card conversion) so you can take enough storage with you for a weekend’s worth of shooting. This recommendation isn’t for everyone, but is intended for those looking to shoot lots of video in 4K, or capture large quantities of high-resolution photos. With write speeds up to 100 MB/s, the SanDisk Extreme SD card ensures that capturing content won’t bog your devices down or cause excessive lag time. It’s a little bit more expensive than the SanDisk Ultra (not much), but if you’re looking for pro performance, it’s money well spent. Experience drone flight from an immersive first person point of view. The DJI Goggles are comfortable and relatively lightweight. The adjustable head strap makes it compatible with most head sizes. Operators can wear them comfortably with glasses, and the goggles themselves can flip up while being worn. You know, just in case you want to take a break in the action and check in on the real world. Compatibility. 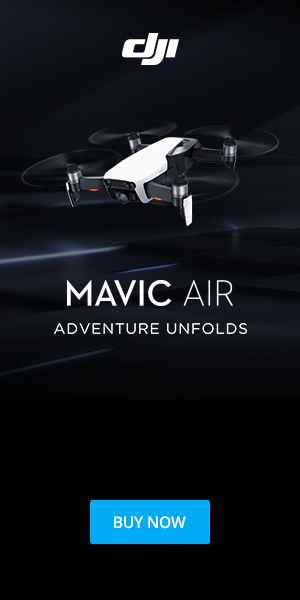 Designed with easy setup in mind, the DJI Goggles connect wirelessly to the Mavic series of drones. Screen Resolution. Unlike many competing goggles, the DJI Goggles have two screens – one for each eye. Each screen also has a higher resolution than most of of the single screen goggles out there. Menu. Rather than using your phone for the menu to make changes to the settings before/during use of your drone, users can do this straight from goggles. A trackpad on the side, as well as two buttons on the bottom, make navigating the menu easy. Extra Features. These goggles do more than just view drone flights. Use the HDMI cable on the side to view photos, or also utilize the headphone port to watch movies on a plane! Use the head tracking feature to direct the camera to mimic your heads movements. Battery. The battery life of the DJI Goggles provides about 6 hours of run time. Price. Goggles of this quality don’t come cheap. Size. The DJI Goggles are bigger than the Mavic Pro, making traveling with them potentially more difficult. Light Leak. While the design does try to fit all shapes and sizes of heads, users with smaller, or more narrow heads may experience some slight light leakage around the side. Motion Sickness. Some users have claimed to experience nausea after prolonged use of the DJI Goggles. If you are prone to motion sickness, too much time using these may invite some nausea.